Houston is “on tap” to lead all of Texas’s cities in one literary travel criteria—the place with the most bookish bars. These wordish watering holes may be inspired by a title, an author, or an inscription, and H-town has them all, including the Mexican-inspired hideaway Under the Volcano, 2349 Bissonet, named after the Malcolm Lowry novel and known for its frozen drinks; Love & Squalor, 2808 Caroline St., whose name, drawn from J.D. Salinger’s “For Esme — with Love & Squalor” is the namesake behind the bar at Weights + Measures restaurant; Hobbit Café, 2243 Richmond Ave., which Tolkein fans will appreciate. It seems no detail was overlooked, down to the menu items (a Fatty Lumpkin, anyone?) and Lord of the Rings memorabilia throughout the restaurant. 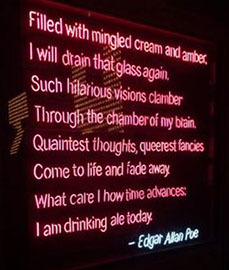 Left: A literary lament on libations from Edgar Allan Poe can be found at Houston’s Bovine and Barley pub. From last call to first editions, Houston offers it all to discerning literary travelers. A quiet midday drive through River Oaks may afford you the opportunity to enjoy the genial curation—and coffee and cookies—of mother/son owners Jeanne Jard and Michael Jones of River Oaks Bookstore (below, left; and right)—voted one of our readers’ favorite Texas bookstores in 2016.
utting-edge events and a wide range of literary and art titles at Brazos Bookstore under the direction of new manager (and novelist) Benjamin Rybek (below, right), to the hands-on interaction on-site and in the community with Valerie Koehler at Blue Willow Bookshop (center), the independent book scene in Texas’s most populous city is as dynamic and varied as Houston itself. 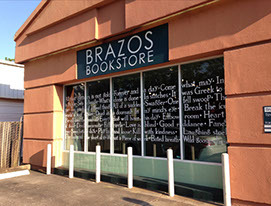 Murder by the Book has laid claim to a unique niche in the mystery genre; Kaboom Books, which also hosts music and creative events, calls itself “Houston’s most exuberantly misanthropic used bookstore”; and the Latino-interest bookstore Nuestra Palabra Art and Books is the first of its kind in Houston. Nuestra Palabra, established in 2016 by self-proclaimed “librotrficante” Tony Diaz, brings to the city a hand-picked selection of Latino/a authors, both nationally-recognized and local, that includes names likes Sandra Cisneros and Houston writer Maria Elenes Cortes. The Houston area tops the state in its sheer number of bookstores, too. (Driving the iconic thoroughfare of Westheimer Boulevard alone will deliver you to a Half Price Books, the aforementioned River Oaks Bookstore, a Barnes & Noble, and yet another HPB.) We count more than thirty new, used, independent, chain, and specialty stores in Houston proper, not to mention destination-worthy stores in nearby locales such as Conroe, Galveston, Spring, and The Woodlands. More than a dozen of these regularly feature touring and local authors for readings and signings, which means that no day of the year need pass, in Houston, without a morsel to assuage your author appetite. On a broader measure of culture, Houston is known as one of the nation’s most philanthropic cities, an a great deal of that largesse has gone into the building of its museums that contribute to the city’s distinctive character. 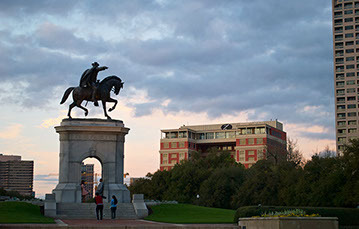 The Houston Museum District comprises nineteen museums located within an approximate 1.5-mile radius of the Mecom Fountain in Hermann Park. Such institutions as the Asia Society Texas Center, the Holocaust Museum Houston, the Houston Center for Photography, the Menil Collection, the Museum of African American Culture Center, the Museum of Fine Arts, and more regularly present literary lectures, book launches, and/or writing events—and most feature excellent in-house book and gift stores. For more information visit their website, aptly titled www.houmuse.com. The 11th Annual National Black Book Festival is set for Oct. 25–27, 2018, in Houston. 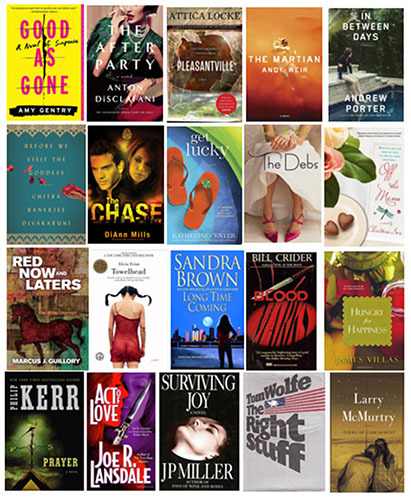 This annual event attracts more than 100 authors and thousands of readers for a weekend of literary exchange. Houston’s TeenBookCon will feature more than twenty-five of the most popular and award-winning authors and illustrators of young adult fiction and set for March 24, 2018 in League City at Clear Springs High School. The Bookworm Festival, launched in 2014, is a fun morning for emerging readers and those who write for them. Librarians and language arts teachers from across Houston comprise the steering committee for this event. It’s held in January in West Houston. Founded in April 2014, Writespace Houston is the city’s newest newest center for the writing craft. As a grass-roots literary arts organization created by writers for writers, Writespace supports writers of all genres, including literary fiction, poetry, science fiction, fantasy, mystery, and young adult. Through their weekly writing workshops led by some of Houston’s finest writing instructors, Writespace seeks to give writers who can’t afford to pursue an MFA in creative writing the same high-quality, intensive training and mentorship opportunities available through degree-granting programs. Writespace will hold its fourth annual literary festival, Writefest, in 2018 April 30 through May 6. The festival included four-day writers’ workshops, panels, and presentations. In addition to hosting its literary festivals and regular weekly workshops, Writespace offers manuscript consultations, write-ins, readings and open mics, and classes and private lessons for young writers. Inprint Houston, a non-profit organization dedicated to inspiring readers and writers, fulfills its mission through the nationally renowned Margarett Root Brown Reading Series, the Cool Brains! Reading Series for Young People, literary and educational activities in the community that demonstrate the value and impact of creative writing, and support for the University of Houston Creative Writing Program. The Barbara Bush Literacy Foundation, headquartered in Houston, sponsors many showcase events bringing to Houston national notables in government and culture who lend their support to community efforts helping provide children access to books and reading. Above: Inprint has a long history of hosting readings by renowned authors. 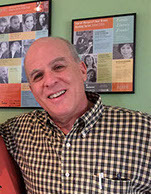 Right: Rich Levy of Inprint House, February 2017. Public Poetry is a nonprofit organization whose mission is to expose people to good poetry and to promote this art form by taking poetry public. Public Poetry collaborates with community partners such as the City of Houston/Houston Public Library, The Museum of Fine Arts Houston, The Menil Collection, and Writers in the Schools/WITS to promote poetry in public venues and to present award winning poets to diverse audiences. Public Poetry originates groundbreaking programs that introduce a roster of award winning poets to audiences citywide, free of charge. 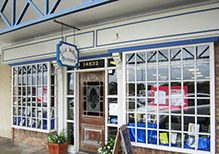 Since launching in April 2011, Public Poetry has been in 17 different venues, from inside the loop to beyond the beltway, organized 53 free poetry events, with over 130 poets participating, including a US poet laureate, 4 Texas state poets laureate and 2 Pulitzer Prize nominees together with local, regional, and several national poets. The Houston Public Library system traces its founding to the creation, in 1854, of the Houston Lyceum, which was preceded by a debating society, a special-interest mechanics’ lyceum, and a circulating library. The lyceum’s library eventually split into a separate institution at the end of the nineteenth century. In 1892, William Marsh Rice, a Houston businessman and philanthropist who later chartered Rice University, donated $200,000 for the construction of a free public library. The facility opened in 1895 and obtained its own building in 1904 with financial assistance from Andrew Carnegie. The separate Colored Carnegie Library, which opened in 1913, became a part of HPL in 1921; the library system racially desegregated in 1953. Throughout the Houston Public Library system are many architectural treasures, including in the heart of the city, the historic Julia Ideson Building (right), whose distinctive and elegant Spanish architecture stands out among the glass contemporary buildings that surround it. As visitors enter the 1926 structure they are transported to a Houston that once was. The sophisticated grandeur and history of the building can be felt as you walk the reflective Spanish-brick floors, through the grand staircase, the Tudor Gallery surrounded by large marble pillars, the Reading Room with its original wooden fixtures, and a one-of-a-kind exhibit room showing some of the Library’s archival collection. Legend has it these days that the Ideson Building is haunted by the ghost of Jacob Frank Cramer, a former library caretaker, and Petey, his dog. The building is named for Julia Bedford Ideson, the first head librarian of the Houston Public Libraries, who served in that role for forty years. But Houston continues to be a front-runner in library service: flash forward to 2016, when Roosevelt Weeks, Sr., deputy director / chief of staff at the Houston Public Library, was named a winner of the I Love My Librarian Award from the American Library Award. The Houston Public Library’s African American Library at the Gregory School provides a very different glimpse of the past in historic Freedman’s Town. The building once housed the first public school for African Americans in Houston. Built in 1926, the it’s now a restored masterpiece that houses many treasured archival collections of African American history in Houston. 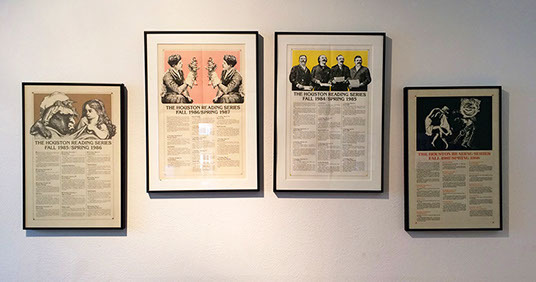 An array of publishing houses light up the Houston publishing landscape, including Bright Sky Press, Arte Público Press, John M. Hardy Publishing, and Mutabilis Press. Launched by Donald Barthelme and Phillip Lopate, Gulf Coast is the nationally distributed journal housed within the University of Houston’s English Department, home to one of the U.S.’s top ranked creative writing programs. The journal spent its nascent years (1982–85) as Domestic Crude, a name that nodded to the major industry of the Houston area. It was a 64-page (magazine-formatted) student-run publication, with editorial advising coming from Lopate, who also contributed work to the first issues. In 1986, the name Gulf Coast premiered. It stuck. After some experimenting, the journal found its dimensions and, eventually, its audience. The journal has since moved beyond the student body of the University of Houston and into the larger world. The lion of the Lone Star Literary scene, venerable Larry McMurtry, has written more than one ode to the influence of Rice University and Houston upon his work, and the Space City has also skyrocketed a multitude of authors onto the national stage. In 1981 McMurtry famously wrote the controversial essay, “Ever a Bridegroom: Reflections on the Failure of Texas Writing,” faulting Texas authors for having ignored the life of the cities. McMurtry has set three novels in his beloved Houston, Texas’s largest city. The Blind Bull (1952) by Rice creative writing professor and program founder George Williams won first prize from the Texas Institute of Letters and seemed to kick off the legacy of letters in Houston. Some of the more notable students Williams helped influence include David Westheimer, William Goyen, Larry McMurtry, John Graves, James P. Miller, and James Korges. 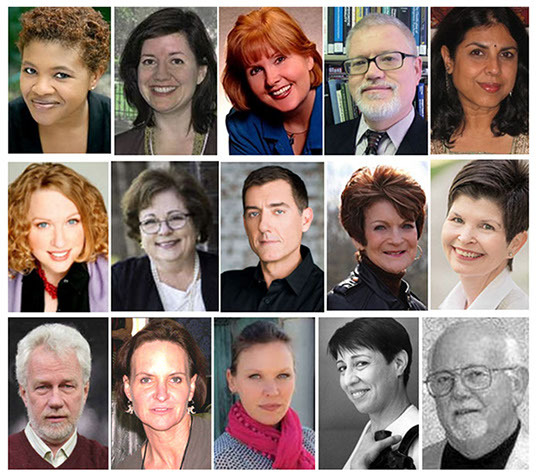 HOUSTON LIGHTS Authors associated with Houston (right) include, from upper left: Attica Locke, Gwendolyn Zepeda, Kerrelyn Sparks, Dean James, Chitra Banerjee Divakaruni, Katherine Center, Kathryn Casey, Justin Cronin, DiAnn Mills, Barbara Taylor Sissel, Robert Boswell, Antonya Nelson, Chris Cander, Sarah Cortez, Larry Watts. Gulf Coast Reads: On the Same Page is an annual regional reading initiative focused on promoting the simultaneous reading or listening to a selected title by those living along the upper Texas Gulf Coast. Each year a representative committee of librarians from the area selects a book that has a broad appeal to adults in their communities, is recognized in authoritative and professional journals, is available in multiple formats from print to downloadable content, and preferably, is available in multiple languages. The title should also lend itself to related programming about the themes or subjects within. The reading initiative’s goal is to encourage communities to read the same title during the month of October in order to encourage readers to come together in discussions about it with neighbors, co-workers, friends, and their families, as well as in classrooms and in libraries throughout the region. For more useful information in planning your visit, go to www.visithoustontexas.com. Above: The University of Houston's creative writing program is nationally ranked.